Passing the football inside the 10 is a completely different game than anywhere else on the field. With the end line working as a pseudo defender, naturally capping routes of depth, windows get much tighter as a quarterback works to the goal line. Last season, teams averaged 1.7 passes per game inside the 10. That, compounded with the fact that the majority of offensive touchdowns were scored inside the 10 last season, means those few reps in scoring range are as important as they are limited. And no one has been more valuable in these limited reps in recent years as Green Bay Packers quarterback Aaron Rodgers. The passing stat most correlated with wins is ANY/A, which is essentially yards per dropback (passes + sacks) with an adjustment for the value of passing touchdowns (+25 yards) and interceptions (-45 yards.) 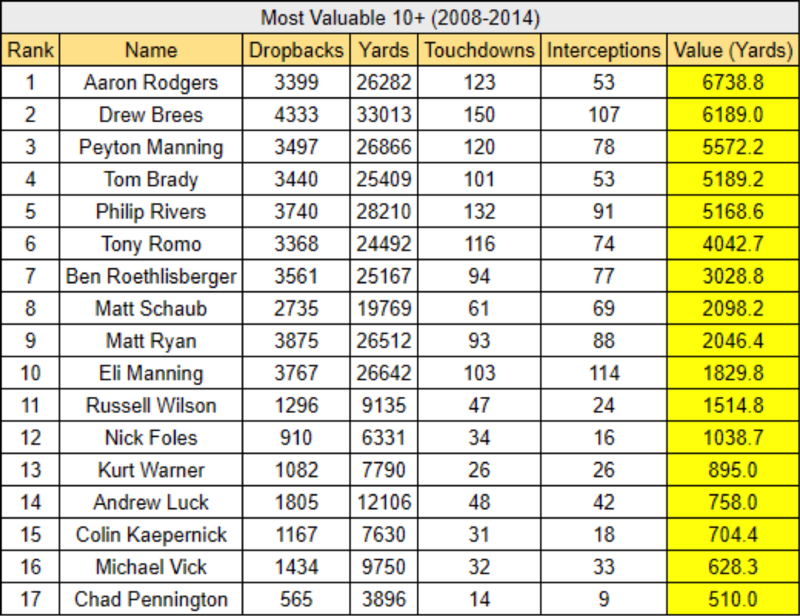 Over the last three years, the average drop back inside the 10 has been worth 7.6 “ANY/A yards.” With 220 yards, 47 passing touchdowns and just one interception off of 104 dropbacks since 2015, Rodgers outpaces the NFL average by a difference of 327 “ANY/A yards”, the most in the league. Mind you, this is all while Rodgers missed the better part of 10 games last season with a collarbone injury. In isolation, this is just a highlight video. This doesn’t tell you what specifically makes Rodgers stand head and shoulders above other NFL quarterbacks in this area of the field. Their style of play in compressed space couldn’t be more different. What stands out immediately is the mobility factor. Rodgers is asked to roll outside of the pocket more frequently by design, while also escaping the pocket to buy time outside of the design of the plays. Rivers is a statue. Because Rivers is more stationary, he is forced to make throws to the back half of the end zone, over the head of defensive backs but short of the backline. End lines are friends of defenders, and defenses are willingly lighter in this area of the end zone, purposely giving Rivers shots at some of the most difficult passes in the sport. Meanwhile, Rodgers’ mobility opens up plenty of space with defenders in a run-pass conflict, leading to wide open touchdowns at times. His quick, compact release also allows the Packers to frequently target slants and passes into the flat which are either thrown to the front half of the end zone or even short of the end zone for scores. 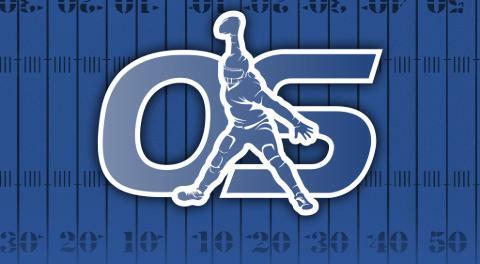 Rivers’ unorthodox passing motion doesn’t quite allow for quick strikes in a phonebooth with defensive backs drooling. This level of efficiency no longer travels to all areas of the field for Rodgers, though. 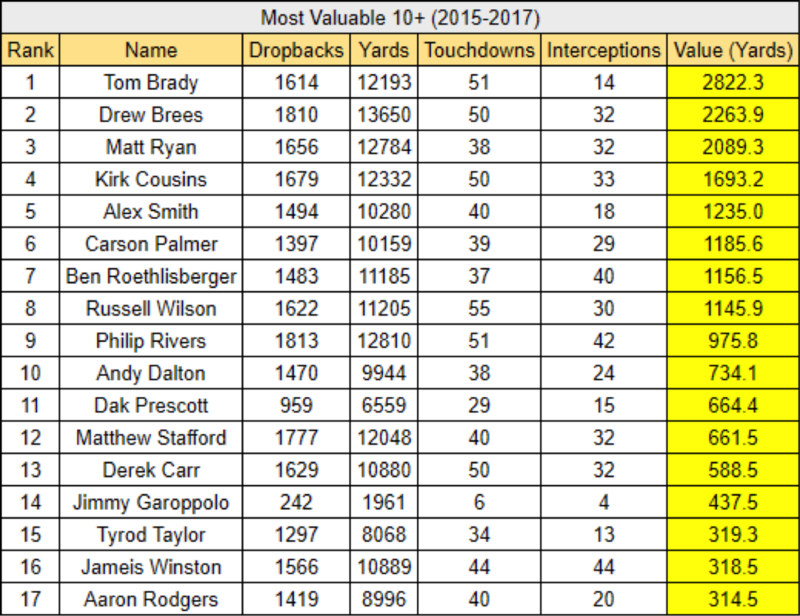 From 10 or more yards out of the end zone, Rodgers’ numbers (1,419 dropbacks, 8.996 yards, 40 touchdowns and 20 interceptions) were the 17th most valuable in the sport over the last three years from an ANY/A perspective. 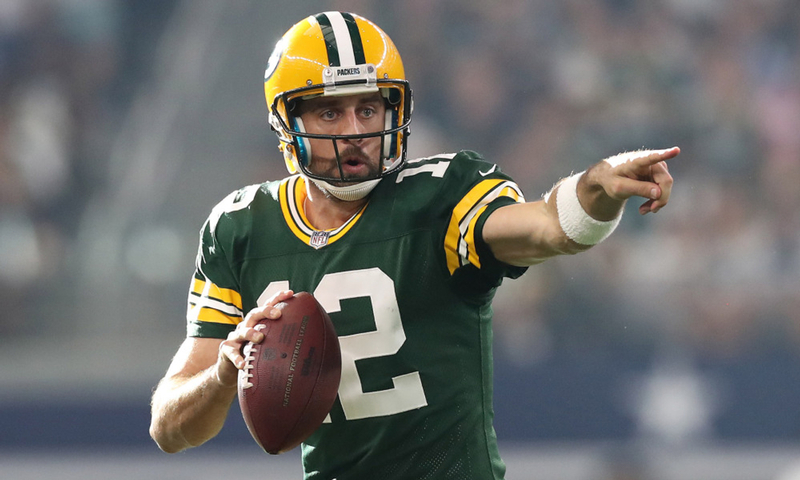 This is in contrast to 2008 to 2014, Rodgers’ first seven years as a starter, when he was the most valuable passer in football from 10 or more yards out from the end zone. From 2008 to 2014, a loaded unit of Packers pass-catchers combined for 68 100-yard games, about 10 per season. In 2011, Sports Illustrated thought enough about the team’s passing game to put Rodgers and SIX different Green Bay targets (Greg Jennings, Jordy Nelson, Jermichael Finley, James Jones, Donald Driver and Randall Cobb) on a mid-season magazine cover. By 2015, Jennings, Finley and Driver were already out of Green Bay. Jones would play his last game in his career with the Packers that year. Nelson missed the season with a preseason knee injury. Only a few years later, the only remaining receiver in his prime from that cover story was Cobb. In a stretch against the St. Louis Rams and San Diego Chargers (time flies), NFL defenses first began to bait the Packers into winning one-on-one matchups downfield with what was left of their receivers. The result? Green Bay made it out of that two-game stretch with a 6-0 record, but the blueprint to stop the Packers, making them win vertically with their receivers, was laid out. They finished their last 10 games with a 4-6 record. Before the Rams-Chargers stretch, Rodgers had posted a 125.9 pass rating on the season. Over the last 12 games of the year, as defenses shifted how they approached Rodgers’ supporting cast, his passer rating plummeted to 83.6. To put that into perspective, Blake Bortles posted a 84.7 passer rating last season. The return of Nelson from injury and the development of Davante Adams has kept the Green Bay passing offense from continuing failure, but it has not come close to rebounding to its 2008-2014 self. Over the last three years, the Packers have averaged just six 100-yard games per season, meaning 100-yard games from individuals are occuring close to half as frequently as they were in Rodgers’ first seven seasons. A supporting cast holding back a quarterback is not a phenomenon exclusive to Rodgers. In 2016, when Tavon Austin was Jared Goff’s top vertical receiver, Goff had a 63.6 passer rating. In 2017, when Austin was Goff’s number four receiver, Goff had a 100.5 passer rating. For everything made of the influence of Los Angeles Rams head coach Sean McVay, often overlooked is the fact that he could not have ran his offense without the newly traded, bought and drafted Sammy Watkins, Robert Woods and Cooper Kupp running routes. At the moment, Adams (4.56-second 40-yard dash), Cobb (4.55-second 40-yard dash) and Geronimo Allison (4.67-second 40-yard dash) are the top three receivers on the Packers’ roster. The newly signed Jimmy Graham could give Green Bay stability at the position that they haven’t seen since Finley, but his final year in Seattle was marked by his disproportionate production in scoring range. The former Seahawk just wasn’t winning winning one-on-one in the middle of the field last year. J’Mon Moore, Trevor Davis, DeAngelo Yancey, Equanimeous St. Brown and Marquez Valdez-Scantling are all young receivers with some level of pedigree on the Packers roster, but expecting one of them to overtake Allison, one of two receivers (Adams) to record a 100-yard game for the team last year, seems like a stretch at this point. To put it simply, Rodgers has recently been, and likely will continue to be, limited (statistically) as a passer, because of his receivers’ ability to win one-on-one vertically. With that being said, it is easy to see how he could return to MVP form if the Packers find him a speed receiver who can threaten defenses on a down-to-down basis. The proof is in his film from the condensed scoring range. There are simply styles of play which are better at masking one-on-one matchups better than others. When compared to Rivers, it’s clear how Rodgers makes the lives of his receivers easier by being able to buy time (essentially calling a new play mid-play) and having a quick release. These are the same factors which set the high floor for the Packers’ passing game in the middle of the field, even if their ceiling is capped by wideout talent. It’s unlikely that Rodgers will give us another MVP season until Green Bay gets him another receiver who can make defenses sweat more as a one-on-one threat, but the Packers passing game will never be the squeaky wheel of the team. 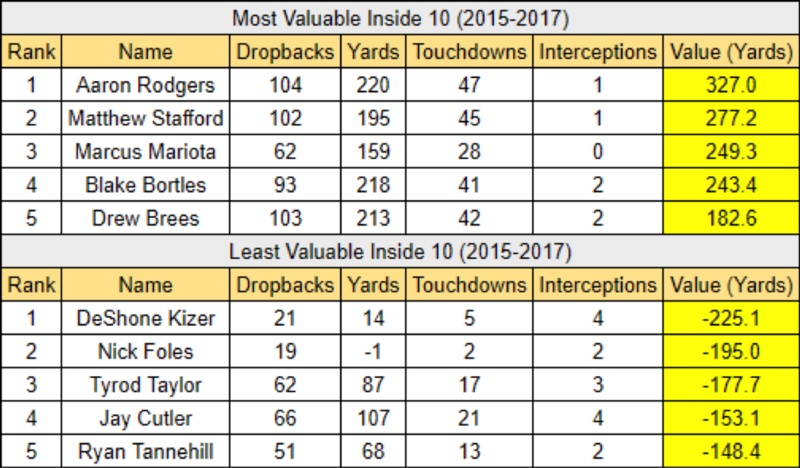 Over the last three years, the Packers have been the textbook case for both the value of a quick-strike, mobile quarterback and the value of (the lack of) receivers who can win in isolation.